When you join a Masonic forum and at some point make known that you are in a mixed lodge, wrath will be upon thee. Many regular Freemasons (especially in the UK and the USA) not only frown upon other forms of Freemasonry, they will constantly target you with terms such as “clandestine”, “bogus”, “fake”, etc. or simply deny you even being a Freemason. Some people are more openminded and accept the existence of other forms of Freemasonry, but Masonic fora are somewhat of a snakepit. They are still very usefull to get information and virtually meet people, but you have to either keep low or accept getting verbally attacked every once in a while. 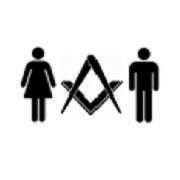 So, is there not a place for (people interested in) mixed gender and female Freemasons to virtually meet in peace? There sure are, see below. I created a ‘sub-Reddit’. Reddit is not exactly a forum, but it can sure act as one. The good thing about Reddit is that is has many “subreddits” that you can “follow”, so even when you follow a subreddit that is very tame, there may be other ones that are more active. There are imaginable many different sort of subreddits, for a variety of your interests. So you just follow a few (or a lot) subreddits. 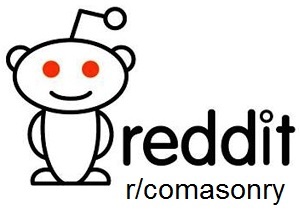 The subreddit can be found at r/comasonry. It started as a private group. Since April 2018 the group is open to see if hat would bring more activity. Another sub-Reddit is r/xxmasonic (the ‘ladies’ Freemasons subreddit, also for ‘co’s’). r/xxmasonic has been around longer, has more users, but it not as active as the following subreddit that I am going to mention. Speaking of snakepits, the most active Masonic forum at the moment is also a subreddit: r/freemasonry. Be sure to follow that one. It has (heated) discussions about mixed gender Freemasonry and women and Freemasonry a few times each week, well, the frequency has dropped recentely.. There are also two Facebook groups that are interesting to join for mixed gender or female Freemasons (or people interested). The first is the American Le Droit Humain Facebook group with 1600 members (pretty active) and another Facebook group called Women In Freemasonry (400 members). Both are closed groups that you can request to join. There are a few more links in my earlier post.